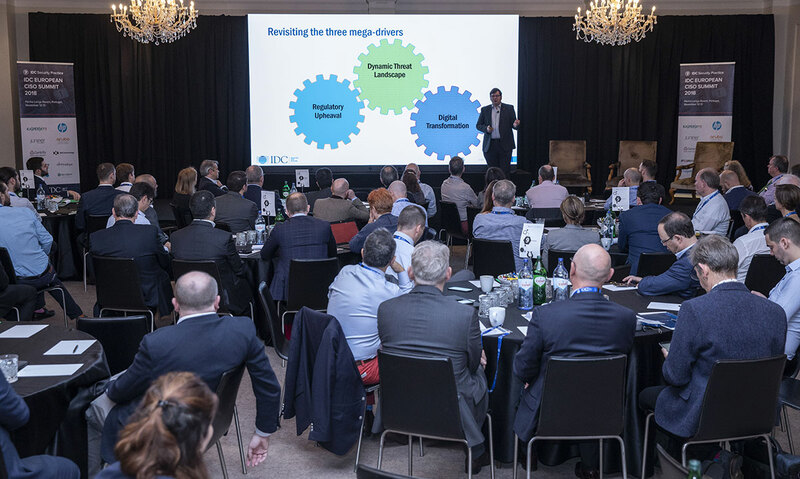 For the third year in a row, IDC will connect top CISOs from all over Europe to discuss how digital transformation, the regulatory environment, and innovation initiatives have significantly changed organizations' tolerance of and exposure to security risk — pushing them to evolve their security and risk management functions. IDC's European CISO Summit 2019 will highlight the importance of conveying security issues in risk terms and how security risk can be quantified and measured. The theme of the summit will be "Risky Business: Understanding Digital Risk to Ensure Digital Trust." Over two days we will engage with workshops, case studies, and debates to determine how these activities can help security teams and leaders to build their influence in the business by enabling digital transformation and providing a foundation of digital trust. It’s all about risk –measuring, understanding and presenting risk to enable digital trust. Current, and planned, privacy regulation is actually impacting business – but how? Changing mindsets in a rapidly evolving threat landscape. Think differently - Building diversity in the, extended, security team. With the universe of connected devices growing exponentially, so is the sophistication and volume of cyber-attacks and data breaches that can cause acute and sustained harm for businesses and people alike. HP is reinventing how to secure the potential of technology that in turn has the power to transform human potential. By integrating protections into everything we create, HP is ensuring security is paramount and our products are resilient to attacks. Our goal is to not simply protect devices data and identities, but reinventing how they are secured, so people and companies can stay a step ahead of an ever-evolving and always disruptive world of attacks. While there will never be a world without cybercrime, people and companies can enjoy a reality where devices are designed to protect themselves. That’s why HP is building a symbiotic relationship between digital life and security, continually delivering the most secure devices on the market and making life better and safer for everyone, everywhere. Aruba, a Hewlett Packard Enterprise company, provides next-generation security and wired and wireless networking solutions for global enterprises of all sizes. These solutions empower organizations to protect data and applications from internal and external attacks, while also saving time for security and IT teams. Aruba security solutions give the context needed to understand analytical security, without putting user data at risk. Using user and entity behavior analytics (UEBA) our platform helps provide the resilience that security teams need to scan individual packets of data, in isolation from the network. By automatically creating rules and permissions, without human intervention, this can also provide business continuity, saving time and money. We believe that implementing robust security needs need a multi-vendor approach, and incorporate an open standards architecture in order to provide a single point of view of the network, no matter what hardware and software is in operation. Rather than asking a security buyer to ‘rip and replace’, spending millions on a new IT environment, our customers can overlay new technology that can enhance the equipment that’s already there, and better protect the data within it. We believe this type of architecture should be available to all, and it should be embedded within the network, which is the point of access to all company information. Centrify delivers Zero Trust Security through the power of Next-Gen Access. The Centrify Zero Trust Security model assumes that users inside a network are no more trustworthy than those outside the network. Centrify verifies every user, their devices, and limits access and privilege. Centrify also utilizes machine learning to discover risky user behavior and apply conditional access — without impacting user experience. Centrify’s Next-Gen Access is the only industry-recognized solution that uniquely converges Identity-as-a Service (IDaaS), enterprise mobility management (EMM) and privileged access management (PAM). Over 5,000 worldwide organizations, including over half the Fortune 100, trust Centrify to proactively secure their businesses. DXC Technology helps clients harness the power of innovation to thrive on change. For more than 60 years, we have successfully guided the world’s largest enterprises and government agencies through successful change cycles. We take pride in our technology independence and our role as a trusted advisor. Our deep experience gives us a clear and confident vision to help clients navigate the future.As the world’s leading independent, end-to- end IT services company, we are uniquely positioned to lead digital transformations — creating greater value for clients, partners and shareholders, and presenting growth opportunities for our people. We are among the world’s best corporate citizens. We have 150,000 employees in more than 70 countries, serving some 6,000 clients. We tap into global talent, powerful next-generation IT solutions and extensive partner relationships to help clients transform digitally and seize opportunities. Our extensive partner network helps us drive collaboration and leverage technology independence. We have established more than 250 industry-leading global Partner Network relationships, including 15 strategic partners: Amazon Web Services, AT&T, Dell EMC, HCL, Hitachi, HPE, HP, IBM, Lenovo, Micro Focus, Microsoft, Oracle, PwC, SAP and ServiceNow. Fortinet (NASDAQ: FTNT) secures the largest enterprise, service provider, and government organizations around the world. Fortinet empowers its customers with intelligent, seamless protection across the expanding attack surface and the power to take on ever-increasing performance requirements of the borderless network - today and into the future. Only the Fortinet Security Fabric architecture can deliver security features without compromise to address the most critical security challenges, whether in networked, application, cloud or mobile environments. Fortinet ranks #1 in the most security appliances shipped worldwide and more than 340,000 customers trust Fortinet to protect their businesses. FireEye is the intelligence-led security company. Working as a seamless, scalable extension of customer security operations, FireEye offers a single platform that blends innovative security technologies, nation-state grade threat intelligence, and world-renowned Mandiant® consulting. With this approach, FireEye eliminates the complexity and burden of cyber security for organizations struggling to prepare for, prevent, and respond to cyber attacks. FireEye has over 6,600 customers across 67 countries, including more than 45 percent of the Forbes Global 2000. With 3,000+ cybersecurity experts, Capgemini and Sogeti offer a full range of services that safeguard the digital and cloud platforms, IT infrastructures, and OT systems of companies and administrations worldwide. Our security specialists use the very best technology products tested and proven by our own R&D team specializing in malware analysis and forensics. We have ethical hackers, an international network of multi-client security operation centers (SOCs) and are global leaders in testing. We Advise. We Protect. We Monitor. Skybox arms security leaders with the broadest set of solutions in security management to significantly reduce the risk of a breach. The Skybox® Security Suite integrates with more than 100 technologies and uses network modeling, attack vector analytics and multi-factor vulnerability prioritization to give unprecedented visibility of the attack surface and insight to key indicators of exposure (IOEs), such as exploitable vulnerability hot spots, unsecure device configurations and risky access rules. This gives security leaders the insight needed for effective, threat-centric vulnerability management and automated firewall and security policy management across hybrid and multi-cloud networks. Our award-winning solutions increase operational efficiency by as much as 90 percent and are used by the world’s most security-conscious enterprises and government agencies, including many Forbes Global 2000 companies. The Gran Miramar Hotel was conceived by architect Fernando Guerrero Strachan, the hotel opened in 1926 as the ‘Hotel Príncipe de Asturias’, inaugurated by King Alfonso XIII. The hotel was at the centre of glamour and style for a decade before closing during Spain’s civil war. The iconic Royal Crown that sat above the entrance was torn down; and the property was requisitioned as a field hospital. In the 40s, 50s & 60s The Miramar Palace was once a hotel again welcoming guests from across the world, including Elizabeth Taylor. If you have questions or comments regarding IDC European CISO Summit 2019, please contact us by filling out and submitting the following form. If you would like to become a partner at the IDC European CISO Summit, please fill out the form below. An IDC representative will contact you shortly.